H2-international: Mr. Huber, as President of the ITT you also have lead responsibility for the new hydrogen center in Bolzano. In the past, you have stated that this is the biggest center for H2 in Europe. Can you back this claim up with figures? Huber: We aren’t boasting about being the biggest plant in Europe. To be honest, this isn’t something that we care about. The most important thing is for the plant to fulfill its purpose; with the production the plant also consists of a visitors’ center with educational facilities – it therefore has a multifunctional purpose. This is the only thing that is important to us. We have constructed a hydrogen center with a production capacity of 180Nm³ H2 per hour – all of which is produced with renewable energy. Connected to this is a public filling station with two gas pumps, one with 350 bars for buses, and one with 700 bars for cars. It is situated in a strategic location adjacent to the Bolzano South freeway exit. Around 60,000 vehicles pass the site every day, see our emblem, and become curious about what we are doing here. We want to make use of our electricity resources ourselves, and make them available for mobility. It is from this site that we are developing hydrogen technology, spreading information, focusing on technical training and education, and developing strategic plans, and so forth. H2-international: What exactly do the three building sections house (see image, p. 2)? Laboratories, workshops, offices, seminar facilities? Huber: Three buildings and one filling station have been built. 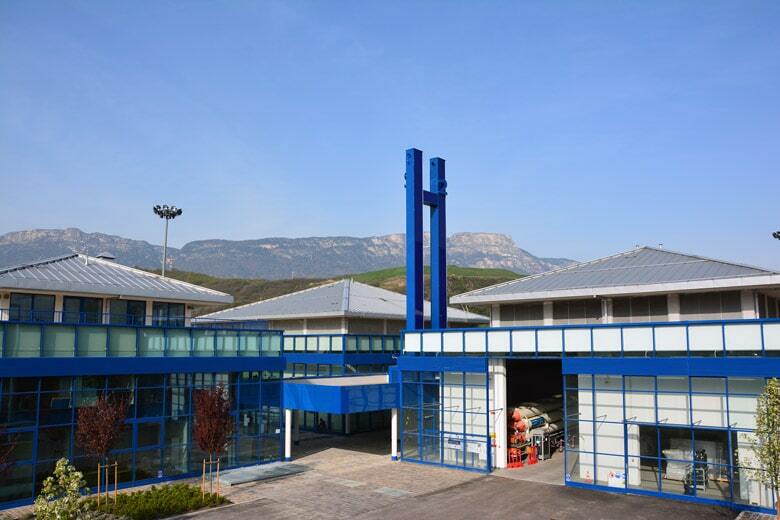 In the first building, the production using electrolysis and the compression takes place. The second building is a storage facility – and primarily serves the storage of the hydrogen. The third building is home to the offices and visitor information center, and is also where the education and training takes place. The entire complex also serves a demonstration purpose toward the general public, who are also included in the developments here, because they should and must know what both they can expect to gain from this new hydrogen technology, and the personal benefits that they can each draw from it. H2-international: The ground-breaking ceremony was held in late 2009, but the site only opened on 5th June 2014. Why did it take so long? Huber: Firstly, there were a lot of bureaucratic obstacles to overcome. Hydrogen is a new topic. Nobody was certain which specific approvals were required or which specific safety precautions were necessary, etc. In addition to this, there was a Europe-wide tender for the technology. This proved to be highly complicated – we weren’t able to simply do everything at once because no standards were available for previously completed systems, which meant that we had to put everything together first and secure everything with the necessary contracts. H2-international: The construction of the H2 center was initially expected to cost EUR 16 million. How expensive has it actually been, and how much has been financed by the European Regional Development Fund (ERDF)? Huber: Please let me correct you here: the buildings were constructed by the company Brennerautobahn AG at its own expense. The IIT has leased the buildings at the current market price. The technical fittings cost EUR 5,210,000, and were financed by the ERDF to the tune of 95%. The price was stuck to without additional costs and was paid on time as agreed in the contract. H2-international: Was a photovoltaic system also installed as planned? Huber: A 17kW photovoltaic system was constructed, and so was a small pond. This serves the purpose of explaining to the visitors that hydrogen only requires sunshine and water, that there’s no need to buy raw materials from foreign countries, and that the only end product is water again. This makes it a sustainable fuel which we can produce ourselves. H2-international: According to your information, the hydrogen you use is green. Does this mean it is produced on site via electrolysis and solar power? Huber: South Tyrol is a hydro power region where more electricity is produced using hydro power than is actually required locally. The electricity which our solar power system produces is used for the offices and the building’s technical systems. The electrolysis takes place with certified renewable electricity from the local network. The use of new sources of electricity in direct form has been planned. We are currently ascertaining where the potential for cheaper electricity is since the costs of the electrolysis depend almost exclusively on the costs of the electricity: cheaper electricity produces cheaper hydrogen. During the winter, the heat from the electrolysis is used to heat the office buildings. H2-international: You now have five H2 buses which are used in scheduled transportation operations as part of the CHIC project, as well as ten Hyundai ix35 Fuel Cells, whereby the cars are also available for hire. Does this mean that anyone can hire out an FC car from you? Huber: The five buses are used in the public transportation system in Bolzano and are very popular with the passengers, the bus drivers and the local residents. The cars are leased to those who are interested in using them on a monthly basis. Companies which attach their logos and information to them, and in doing so advertise for a technology of the future, have shown an especial level of interest in them. We are happy about this, and it also adds to our success. Those who only need a car for a day or two can borrow our company car, but only in exceptional cases. The other nine vehicles are on long-term lease, with waiting lists for them of several months. H2-international The then South Tyrol Governor, Luis Durnwalder, said the following at the ground-breaking ceremony: “South Tyrol views hydrogen to be an important source of energy for the future, and one which is also produced locally.” However, it subsequently appeared to be the case that the support in South Tyrol might be starting to fall away. What is the current situation regarding the support from the region? Huber: The support from the world of politics in South Tyrol has never fallen away. A new state government has been in office since the start of 2014. It has been setting new standards, but they are appropriate. We are also working with the state government on a general strategy which requires detailed work and time. H2-international: The “for and against” discussions were sometimes extremely noisy. There were repeated criticisms as to whether such a high-cost project was necessary. Have the critics now been silenced? Huber: Discussions of this kind always take place when new technology is introduced. We always take those who raise critical enquiries seriously and respond to them in detail, which also includes arranging visits to our plant, where we can then provide personal explanations. It is necessary to clarify that hydrogen not only means the replacement of a fossil fuel with a renewable one, but also that hydrogen constitutes a system, fulfills an energy storage function, and also facilitates the efficiency of renewable sources of electricity which would not otherwise be able to operate efficiently. Last year, around 2,500 visitors convinced themselves of the system’s efficiency. This has made it a hands-on technology. In the second half of 2014, over 240 articles, interviews and portrayals were published in the public media – and not one of them was negative, which is a positive development. Criticism is inevitable – but constructive criticism is to be taken seriously and improves the situation. Recently, however, the critics seem to have become aware of our positive approach. 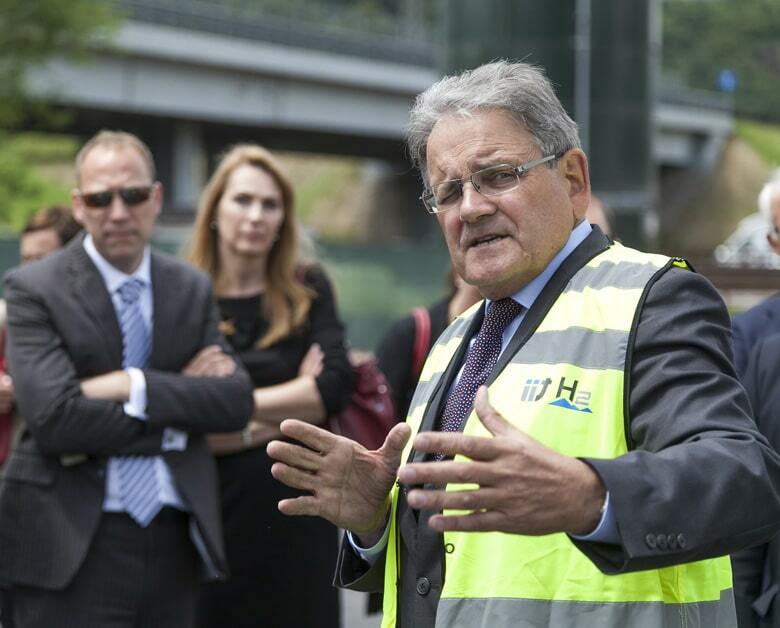 H2-international: In addition to other points of criticism, with five fuel cell buses costing EUR 9 million, your project has been accused of being very expensive, and that the buses have suffered frequent breakdowns and require constant repair. In addition to this, they are only suitable for routes that have a gradient of less than one percent. What is your response to these points? Huber: The EUR 9 million is the total cost of the five buses for five years of operation, including the costs of the fuel, insurance, personnel and the conversion of a bus depot. These are equivalent to the costs accrued by diesel buses in the same time frame. It is necessary to assess costs of this kind properly before leaping to the wrong conclusion. Incidentally, the buses have now attained an availability of 95% and have proven no more susceptible to faults or repairs than the diesel buses. And as regards the 1% gradient: in the run-up to this project we completed test drives with hydrogen buses that were fully loaded from Bolzano to the Seiser Alm which is 2,000m above sea level on a route taking in 16% gradients without experiencing any problems, although the buses are designed for city operations. Plenty of trash is reported in the media these days which is read by many people – the end of the world was predicted according to the Maya Calendar and read by lots of people, but I don’t think many believe it! H2-international: In 2005, it was announced that this location was going to be part of a “hydrogen mile” from Munich to Verona with several H2 stations (every 100km). The talk is now of a “green corridor”. What is the position with this corridor? Are there any more stations now? Huber: In southern Germany, there are now filling stations in Stuttgart and Munich. Bolzano has been operating for a year. On 21st May 2015, a hydrogen filling station operated by OMV opened in Innsbruck. Plans are under way to open one in Rovereto at Lake Garda. Verona and Modena are set to follow. The hydrogen mile is part of a green corridor from Munich to Verona and Modena. One filling station is set to be completed along the freeway every 100km. The project isn’t a dream; there is a genuine will to make it happen. But it will take some time. H2-international: Your location is a partner of the project HyFIVE (Hydrogen For Innovative Vehicles) that was financed by the EU and began in April 2014. What is your role in this project? Huber: IIT is helping to develop a fleet of cars, but above all else to push ahead with the construction of filling stations along the Munich-Verona-Modena route, thereby connecting southern Germany with northern Italy. At the same time we are planning to link in the South Tyrol region up with local companies so that the H2 technology leads to the development of a hydrogen economy from which South Tyrol then benefits. H2-international: Together with Stuttgart, Munich and Innsbruck you are creating the Cluster South. Is this Hydrogen Cluster South in a state of competition with Copenhagen and London, or is it more of a collaboration? Huber: There is no competition, only collaboration, with every partner setting and pursuing their own priorities. We exchange our results and experiences on a regular basis. This means we all benefit from one another. Different H2 starting points are developing, becoming known and slowly growing together. It is important to understand that the fuel cell cars produced by most of the car companies will be available on the free market over the next five years. They will only go into use, however, where the appropriate infrastructure exists, such as filling stations, service stations, etc. We want to benefit from this and we want local industry to be included as a user and above all else as a producer of the components. H2-international: What are your further plans right now? Huber: After our initial steps in the area of mobility, which is set to grow with additional filling stations and the expansion of the bus and car fleets, we will be focusing on the stationary area, such as building services. The training in the technical colleges and vocational schools is set to be strengthened, as we need well-educated people so that the developments can continue and lead to success. Hydrogen technology isn’t created on its own and requires considerable levels of hard work and dedication. H2-international: Thank you very much for this interview Mr. Huber.